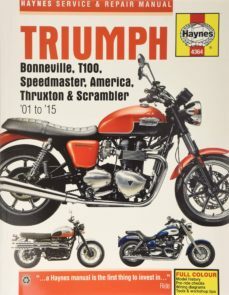 Complete coverage for your Triumph Bonneville, T100, Speedmaster, America, Thruxton & Scrambler (01 - 12) -- Routine Maintenance -- Engine, Clutch and Transmission -- Cooling system -- Fuel and Exhaust system -- Ignition system -- Frame and suspension -- Brakes, wheels and final drive -- Electrical Systems -- Wiring Diagrams -- Fault Finding With Haynes Manuals Online you get all the trusted content of a printed Haynes Owners Workshop Manual but with additional features to help you get the job done. Haynes takes DIY into the digital age with this new product which provides the following benefits:  All-colour photographs with approx. 1,000 featuring in each product.  Photos can be enlarged so you can view key details.  All-colour wiring diagrams to help track problems quickly and easily.  Easy search functionality featuring 'instant display'.  Dictionary of technical terms.  Hyperlinks to additional relevant information in other manual chapters.  Quick links are provided to take you to the most popular DIY tasks.  Fault finding section allowing you to quickly ascertain the cause of a particular problem.  Conversion calculator for imperial and metric units. Bonneville 790cc 00 - 06 Bonneville 865cc 07 - 12 Bonneville SE 865cc 09 - 12 T100 790cc 02 - 04 T100 865cc 05 - 12 America 790cc 02 - 06 America 865cc 07 - 12 Speedmaster 790cc 03 - 04 Speedmaster 865cc 05 - 12 Thruxton 865cc 04 - 12 Scrambler 865cc 06 - 12.